Nordstrom, the conservative Seattle-based department store, is bringing in Topshop, the British fast-fashion chain with rock ‘n’ roll flair. Topshop, along with the men’s brand, Topman, will be introduced to Nordstrom stores in September and sold through Nordstrom.com, the companies said Thursday. Topshop, which sells pieces inspired by runway trends and street fashion, is expected to add some freshness to Nordstrom, which has lacked a brand with such quick runway-to-retail turnaround. 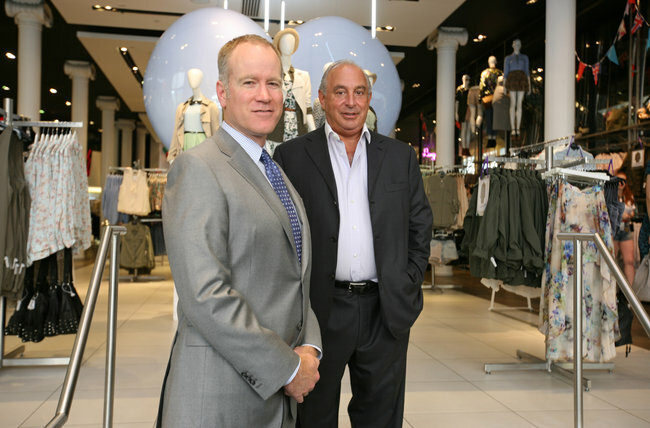 “This will be a new customer for them, and a new customer for us,” Philip Green, the owner of Topshop, said in an interview Thursday at Topshop’s New York store in SoHo, one of its three stores in the United States.Nordstrom has been experimenting with different types of retail, acquiring the flash-sale site HauteLook and bringing the e-commerce brand Bonobos into stores. Department stores want to bring in young shoppers, and partnerships like this are a popular way to do it. In 2010, J.C. Penney began carrying clothes from the fast-fashion brand Mango, under its MNG by Mango line. On Tuesday, Neiman Marcus and Target announced they would both be carrying Christmastime collections from 24 designers like Carolina Herrera and Derek Lam. Nordstrom will add Topshop to 14 stores in September. Pete E. Nordstrom, president of merchandising for Nordstrom, said the 14 stores represent a range of geographies, sizes and shopper demographics. Mr. Nordstrom said the hope is for the company to be able to get a sense of what worked, and from there bring in Topshop and Topman merchandise for most of its stores. The Nordstrom offering will primarily be a smaller selection of what is available at Topshop proper, though some styles and patterns will be exclusive to Nordstrom. Kate Phelan, Topshop’s creative director, showed off some fall clothing that Nordstrom can choose to sell, including a women’s leather jacket with faux shearling trim and buckles at the neck, a men’s peacoat in a Navajo pattern and a women’s cable-knit sweater in ombré gray. Nordstrom will also carry Topshop and Topman accessories, including shoes, bags, makeup and grooming products. Ms. Phelan said that she expected Nordstrom shoppers to be more conservative, but that Topshop would still offer a wide range of styles. “We make them feel it’s very easy to understand how to mix a combat jacket with a lace skirt,” she said. The merchandise will be delivered weekly, which, Mr. Green said, will bring customers into Nordstrom stores frequently. “That speed is appealing,” Mr. Nordstrom said. The department store is allocating about 2,500 square feet for the women’s Topshop merchandise, and 1,500 for the men’s. Mr. Nordstrom said the mannequins and signs would be similar to those in a Topshop store, though Nordstrom will not put walls around the merchandise. While Topshops usually blare music, Nordstrom is known for its tinkling pianos. Mr. Nordstrom said that, at least for now, “it’s going to live amongst what we do.” A D.J. probably won’t be setting up a station in the Topshop section anytime soon. Topshop is not currently in any United States department stores, though it is available in Canada at The Bay. With only three stores in the United States, Topshop’s United States division is a tiny part of its business. It has 319 stores in Britain and about 140 elsewhere in the world. The international stores are largely franchised, though the United States stores are wholly owned. The parent company’s business has recently slipped as demand in Britain has waned. The Arcadia Group, Topshop’s parent, which also owns several other retail brands, reported in November that its annual profit had fallen 38 percent and sales at stores in Britain that have been open at least a year had dropped 1.8 percent. Mr. Green said on Thursday that the United States business was healthy and that Topshop wanted a $1 billion business in America within five years. The New York store, Topshop’s oldest in the United States — it opened in 2009 — has sales of $40 million to $50 million. Mr. Green said that the Nordstrom deal would not affect Topshop’s plans to open stand-alone stores in the United States and that he was considering opening another one in New York City and one in Miami. Sales at the New York store rose 20 percent in the first six months of the year compared with sales a year earlier, he said. Mr. Green said he expected the Nordstrom partnership would help him figure out what to carry at other American stores. “Obviously, there’s places in America we’ve never been — we need an editor to give us a little bit of direction,” he said. Mr. Green said Topshop sells many pieces in high volumes, which would help Nordstrom’s sales. “The units are crazy,” he said. The Topshop-Nordstrom courtship started when Pete Nordstrom called Mr. Green in late February to see whether he was interested in a deal. Mr. Green said he had been approached by several retailers about adding Topshop merchandise, but he said he was not interested in being in a mass-market store — Topshop rarely discounts — and he did not want to be in a store where he would be competing with other quick-turnaround brands. Mr. Green was in Las Vegas preparing for the opening of a Topshop store there when he received Mr. Nordstrom’s call. There was a Nordstrom in the same mall where Topshop was opening, and Mr. Green told Mr. Nordstrom he would call him back. He bustled down to the Nordstrom, where he checked out the merchandise, then brought the general manager and men’s and women’s merchandise directors back to Topshop so they could see what his brand was about. “I said, now you can call your boss and tell him if it’s any good,” Mr. Green said. Mr. Nordstrom flew from Seattle soon after to meet with him in Las Vegas. They toured each other’s stores, then sat down over tea and cheesecake at a Nordstrom cafe to make a deal.